Kalatozov's 1959 Siberian tale of survival joins the Criterion Blu-ray line-up in March. 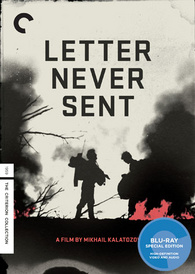 In an early announcement to retailers, Criterion says 'Letter Never Sent' will be released on Blu-ray on March 20. The Blu-ray will feature a 1080p digital transfer, an uncompressed mono soundtrack, and supplements include: Return of the War Room, a 2008 documentary in which advisers James Carville, George Stephanopoulos, and Paul Begala and others reflect on the effect the Clinton war room had on the way campaigns are run; Making The War Room, a conversation between the filmmakers about the difficulties of shooting in the campaign's fast-paced environment; Panel discussion hosted by the William J. Clinton Foundation and featuring Carville, Clinton adviser Vernon Jordan, journalist Ron Brownstein, and surprise guest Bill Clinton; Interview with strategist Stanley Greenberg on the increasing importance of polling; and a booklet featuring an essay by writer Louis Menand. Suggested list price for the Blu-ray is $29.95. You can find the latest specs for 'Letter Never Sent' linked from our Blu-ray Release Schedule, where it's indexed under March 20.